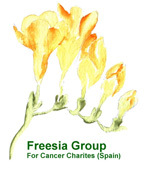 The Freesia Group is a legally registered, Salou based, non-profit organisation, founded in 2002/3, raising money for cancer charities here in Spain, and Freesia’s group of volunteers have now raised over €350,000 for our supported cancer charities. All the money collected and donated from the activities and events we organise goes directly to the three cancer charities we support here in Spain and these include: the AECC in Tarragona, CNIO in Madrid and AFANOC in Tarragona. The Freesia group is run by a local team of VOLUNTEERS, giving their own valuable time and energy for this very worthy cause. Freesia volunteers organise all the events, put up posters, collect the money, control the sellers, man the food and drinks as well as our own Freesia stalls at all the events we organise. The Freesia Group would like to inform you all that due to our fund-raising efforts during 2018 we raised more than 16,518 Euros so were able to give cheques to the AECC in Tarragona for 5,000 Euros, the CNIO in Madrid for 5,000 Euros and the children’s cancer charity AFANOC in Tarragona 6,000 Euros as well. A big thank you to all that help during 2018 and hope for better results this year. If you would like to get involved or have an idea for a future event then please let us know. Please select the event above in which you want to order a table, pitch or ticket.